Brundage as most of SW Idaho is low in snow, but the skiing is not bad at all. Late in the afternoon I skinned up and skied a single run with friends. Conditions were better than I expected, and with proper selection it was possible to ski untracked lines with 10-15 cm of soft pow in a good base and avoid buried "mines". One of my companions had a loose binding, he had to ski down on a single ski! Earlier this week I had the chance of spending the day with University of Idaho graduate students talking about the Science of Avalanches. During the morning we meet at the MOSS campus in Ponderosa State Park, and we finished the morning simulating flour (slab) and sugar (weak layer) avalanches in an inclined board. In the afternoon the graduate students had the chance to dig snowpits at Brundage, look at facet crystals, perform stability tests, and practice with transcievers. The Brundage snowpack at North and West exposures is shallow at 6000 feet, with no more than 50 cm at the deepest location. North aspects have a snowpack that is mostly faceted, and with some layering but very little hardness (or cohesiveness) difference between the layers. West aspects showed a more settle snowpack with round grains in the bottom 30 cm, mostly small facets above the 30 cm depth (from the ground). The top 10 cm (40 to 50 cm surface layer), consisted of mixed grains (facets showing rounding). Stability tests did not find evidence of instability. Several students were interested in transcievers recommendations. And during the last few weeks many friends and acquaintances continue to ask for guidance in the purchase a transceiver. 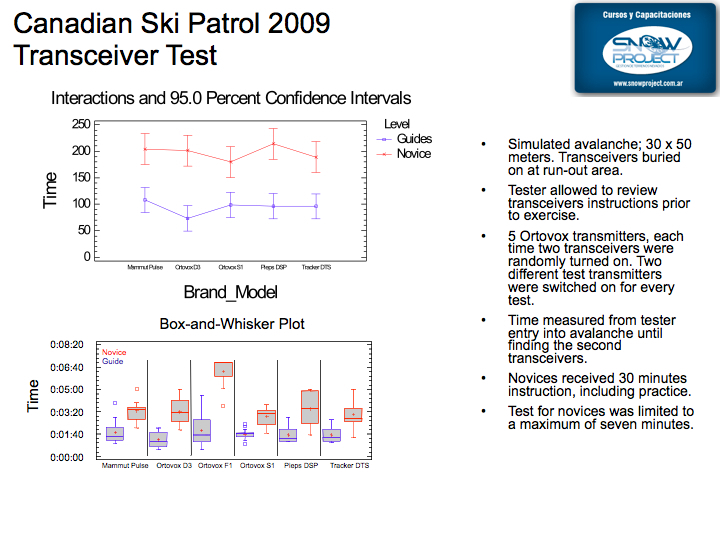 The above slide set summarizes the statistical analysis I performed for a transceiver company. The results are very clear, Analysis of Variance did not detected statistical difference in search perfomance between transcievers manufacturers/brands for novices as well as Guides. However, the Ortovox F1 included in the Box & Whisker charts (bottom chart) did not performed well in the rescue scenario, and I removed that transceiver from the ANOVA (top chart). 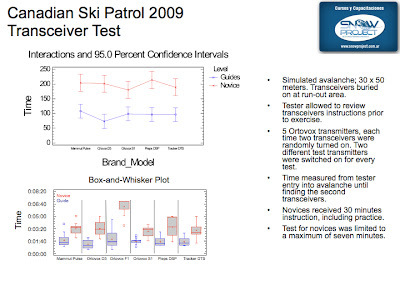 In summary, this study suggest that any of the 2 and NEW 3 antennae transcievers will result in good search times, and brand selection is a personel preference. Also it documents that novices can improve times with rescue practice in order to reach comparable search times attained by "Guides". 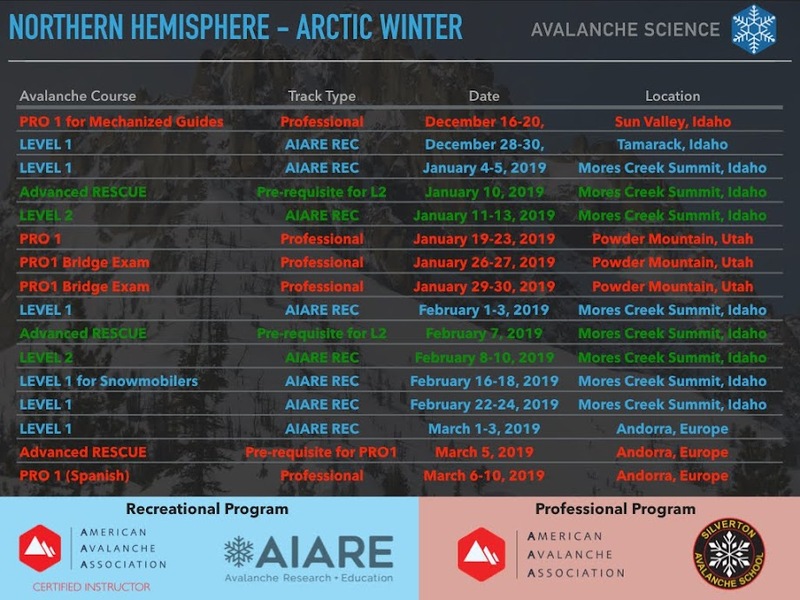 For advanced recreationists, avalanche professionals, and mentors/instructors. I strongly recommend to acquire a 3 antenna transceiver. The motivation is that this user has influence on his peers, and it is important to model behaviors as well as rescue gear we want students and ski companions to own. The most important characteristic of a 3 antenna transceiver is it ability to greatly suppresses the dual minimum when transcievers are coupled (antennas have same orientation). This is not critical for a well trained professional, but it is important for novices. And the best way to encourage novices to acquire a 3-antenna is not to brag how well a pro can search with old gear, but to be a role model, and own a 3-antennae transceiver.